SINGAPORE, Aug. 25, 2014 – Boeing (NYSE: BA) announced today an order by BOC Aviation for 50 737 MAX 8s, 30 Next-Generation 737-800s and two 777-300ERs (Extended Range). The order, valued at $8.8 billion at list prices, is the largest in BOC Aviation’s 20-year history and part of the Singapore-based leasing company’s effort to grow its portfolio of fuel-efficient airplanes. 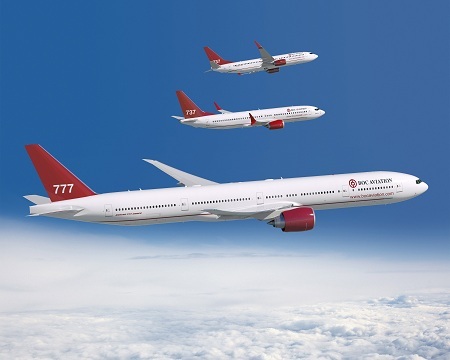 Pictured here is a 777-300ER, a 737 MAX and a Next-Generation 737 in BOC Aviation's livery. SINGAPORE, Aug. 25, 2014 /PRNewswire/ -- Boeing (NYSE: BA) announced today an order by BOC Aviation for 50 737 MAX 8s, 30 Next-Generation 737-800s and two 777-300ERs (Extended Range). The order, valued at $8.8 billion at list prices, is the largest in BOC Aviation's 20-year history and part of the Singapore-based leasing company's effort to grow its portfolio of fuel-efficient airplanes. "Following the successful placement of the 50 Next Generation 737 aircraft that we ordered in 2006, this is a continuation of our commitment to be responsive to airline customers which are expanding or replacing older fleets," said Robert Martin, managing director and chief executive officer, BOC Aviation. "The 737 is known for its operational and fuel efficiency, and BOC Aviation expects healthy demand for the Next Generation 737 and 737 MAX variants in the next seven years." The order adds to BOC Aviation's fleet, which is among the youngest in the leasing industry with an average of less than four years. "BOC Aviation has established a proven track record in the airplane leasing industry," said Dinesh Keskar, senior vice president Asia Pacific and India Sales, Boeing Commercial Airplanes. "They have played an important role in the success of the Next-Generation 737 and the 777-300ER in the leasing market by helping place the airplanes with airlines worldwide. We're excited about our continued relationship with BOC Aviation and look forward to working with them on the new 737 MAX." The Next-Generation 737-800 is the best-selling version of the highly successful Next-Generation 737 family, because of its ability to deliver outstanding, dependable operational and financial performance across the widest wide range of missions. The 737 MAX incorporates the latest-technology CFM International LEAP-1B engines to deliver the highest efficiency, reliability and passenger comfort in the single-aisle market. The 777-300ER extends the 777 family's span of capabilities, bringing twin-engine efficiency and reliability to the long-range market. The airplane can fly up to 7,825 nautical miles (14,490 kilometers) and is equipped with GE90-115BL engines, the world's most powerful commercial jet engine.